+$If you’re in the market for a portable workstation PC, HP’s latest has to be on your list . +$One of the very best workstation laptops out there, the ZBook powers through any task with aplomb – but it’s questionable whether you really need it to be convertible. The range of options is bewildering, but to handle most creative tasks, we recommend going for at least a Core i7 model. +$A level up from your average laptop, convertible workstation PCs include top-level processing and graphics to enable you to do your best work on the move. 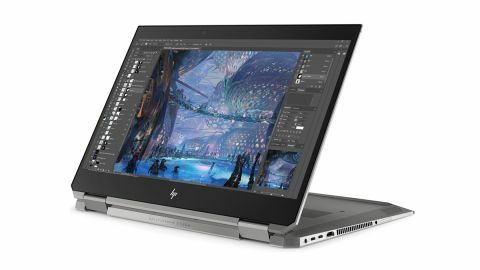 Suitable for professional video editing, game development and design apps, the HP ZBook Studio series features the latest generation Intel Core i5, i7, i9 or Xeon processors, Nvidia Quadro graphics, fold-back 15.6-inch 4K touchscreen display, a surprisingly long battery life and a very portable but durable design. +$But the question is, do you need the power of a workstation in your laptop, or might a pro laptop like the MacBook Pro, Microsoft Surface Book or Dell XPS better suit your needs? Let's find out by taking a look at the HP ZBook Studio x360 in more detail. +$As always with laptops of this calibre, numerous configurations are available. Our review model is the top-line model based around the six-core Intel Xeon E-2186M vPro processor clocked at 2.9GHz. It’s maxed out in other areas, too, with 32GB of DDR4-2666 memory, 1TB PCIe SSD and a 4K display driven by Nvidia Quadro P1000 graphics with 4GB of DDDR5 memory. That clocks in at $3,399 (around £2,600) but various options are available (depending on where you live) from Core i5 upwards. For example, a base model with Core i5 8GB of memory, full HD display and 256GB SSD comes in at $1,719 (around £1,315). +$However, if you’re going to opt for a workstation notebook you'll need to be looking at the slightly-further-up Core i7 version with 16GB of memory, 512GB of storage and that 4K display, which costs $2,321 (around £1,776). +$As you’d expect, performance isn’t lacking with such a high-end ZBook. In+$Geekbench 4+$, the multi-core score clocks in at 20,246 and single core at 5,488. The former score is comparable with a Mac Pro desktop, for example, and is marginally better than the Dell Precision 3530 workstation laptop. Its+$PC Mark 10+$score of 4,628 is among the best we’ve seen. +$In terms of battery life, we’ve seen some numbers up to 9 to 10 hours, but personally managed to get around 8.5 during everyday use. However, nothing we threw at this machine - including working on multiple large layered Photoshop files, having numerous Chrome tabs open, streaming video, chat services and Spotify on the go - slowed it down. +$Most configurations of this laptop have a full HD display, but our review model ups the ante with a 4K (3,840 x 2,160). It’s glossy, like many displays these days, but super-bright, clocking in around 370 nits, which is significantly better than many competitors. It's also worth noting that at the time of writing, the machine was being used in a room where full sunlight streamed through large windows and there were no issues with screen viewing whatsoever. +$The viewing angle is also impressive – handy for scenarios where you might be showing content to a client or colleague. And, as with many high-end Windows laptops, there’s a touchscreen. +$Of course we can't not mention the display's fancy trick – it’s fully convertible, so you can stand the laptop in ‘tent’ mode or twist the whole thing around to be a Windows 10 tablet. We love these kinds of machines and their capabilities, but before you get drawn in by the novelty of being able to transform your device, ask yourself whether you would actually use it in its various modes before committing to buying. +$The keyboard is thoroughly pleasant to type on, with a nice bouncy feel. If you’ve used one of the new-style MacBook Pro or MacBook Air keyboards, you’ll be pleased to know that this isn’t like that – there’s a decent amount of travel in the keys. There is no numeric keypad though, so that’s something to bear in mind if you often use one. +$The ZBook Pen stylus is a light, Wacom-style stylus with 4096 levels of pressure, which works well when applying varying degrees of force. Now that Windows 10 is fully touch and pen-enabled with Windows Ink, you can do pretty much anything with a flexible stylus like this. +$The ZBook isn’t distinctive in terms of look and feel, but in many ways it’s a bonus that it isn’t – you have to look closely to see the ‘mobile workstation’ branding on the spine of the notebook, while the grey finish is sleek but doesn’t draw attention to the fact that you’re carrying around an expensive device. Another bonus is the fact that the device has been tested to a military grade and can cope with drops, humidity, extreme cold, dust and altitude. +$Windows 10 Pro for Workstations is on board to support the Xeon processor and the Bang & Olufsen enhanced sound is impressive and really projects into the room. While you’re always likely to edit video using headphones, the speakers will be more than good enough if you need to unplug and showcase some work to a group of colleagues or clients. +$In terms of ports, most bases are catered for without being too retro. There are plenty of other chunky workstation and pro-level PCs that come with a more generous helping of legacy ports, but the HP’s design make it worth carrying around a dongle if you occasionally need to connect to older hardware. There are dual USB-C Thunderbolt 3 ports, two USB 3.0 ports (including one that charges), a SIM slot, an SD card slot, the Kensington security lock notch and and HDMI port, too. The power button is on the side as well. Our review model is compatible with Intel vPro including remote management and fingerprint reader/Windows Hello logon via the webcam. +$As you’d expect, the HP ZBook Studio x360 G5 isn’t feather light. Starting at 2.3kg, it’s a little heavier than the 15-inch MacBook Pro, but considerably lighter than the Dell Precision 3530, for example. +$HP ZBook Studio x360: Should you buy it? +$The ZBook Studio X360 G5 is a stunning machine in so many ways, but if you’re considering one of the lower-end versions – especially with Core i5 – then it’s worth considering other more conventional options. And by more conventional, we also mean non-convertible. Unless you’re going to be doing presentations or using this laptop in tablet mode, it probably isn’t worth paying the extra for these features. But if you are and have the budget for it, you’d be hard-pressed to find such a great combination of performance, portability and overall brilliance. +$The Surface Book 2 is a slightly different option to the ZBook Studio X360 G5 in terms of its convertibility. The screen actually pops off and can be used as an independent tablet – or it can be reattached in reverse so you can use the laptop for viewing content in ‘tent’ mode. Like the HP, it can be specified with various options but, like the MacBook Pro, starts with more mainstream options. +$The world’s most iconic laptop, the MacBook Pro goes from strength-to-strength and its premium, powerful versions are a match for most high-performers. However, those premium models can get expensive and, unless you’re really tied to using a Mac, there are plenty of Windows options out there worth considering. +$The Precision is probably the closest competitor to the HP with stacks of processor choices and Nvidia Quadro graphics, but it’s uglier and heavier. The Xeon option also isn’t as powerful. However, Dell does discount its Precision laptops quite often, so you may be able to get a good deal.